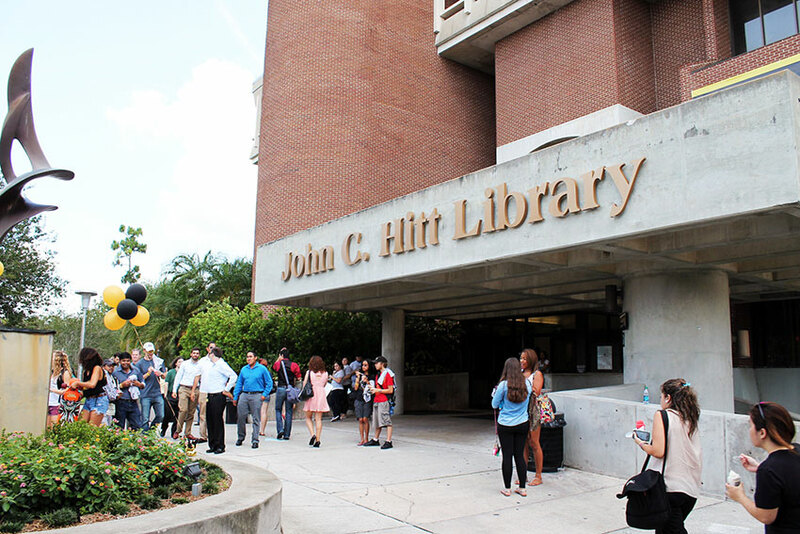 Due to a planned power outage during this time, the John C. Hitt Library will be closed from Saturday, 12/16/17 through Monday, 1/1/18. Library resources will be available at library.ucf.edu. Please return books by Friday, December 15, and check out books you need by Friday, December 15. Book requests received after Wednesday, December 6 will be sent forward in January 2018. Article requests will continue to be processed until Wednesday, December 13. Document Delivery requests will be processed until Thursday, December 14. LibTech will perform regularly scheduled maintenance on all items during Winter Break. iPads will no longer be circulated after 5:00pm on Thursday December 7th. All other LibTech items (except items with 4 hour loan periods) will no longer be circulated after 5:00pm on Saturday December 9th. The John C. Hitt Library will open on Tuesday, January 2, 2018. During spring and summer 2017, a total of 105 new electrical outlets were installed in the John C. Hitt Library. Many are quads, meaning 4 devices can be plugged into the outlet. All have a USB connector. 9 are currently “in process”, almost completed. A few are “swap-outs”, replacing old outlets. But most are completely new, bringing power to seats where it was previously inaccessible. 24 outlets are on the 2nd (main) floor. 29 outlets are on the 3rd floor. 52 are on the 4th floor. Restrooms on the 1st and 2nd Floors in the “back half” of the building are closed for renovation. Newly renovated restrooms are open on the 3rd and 4th Floors. The Student Union side of the 3rd floor is now open! This means that the front side of the 3rd floor is now closed for work on the sprinklers. These items are inaccessible: Books with call numbers HT1507- M, Oversize books J-Z, Media and Current Periodicals. Search for the item you would like in the UCF catalog and click on Place a Hold in the bottom right corner of the record. Your item will be retrieved and you will be notified to pick it up at the Circulation Desk. A path remains open to the LibTech Desk from the “Bank of 2 elevators” and North and East stairs. Only one elevator remains open in the “Bank of 3” elevators on the south side of the building as work continues on the other 2 elevators. The west stairwell is currently closed. All others are open. Work continues on the 1st and 2nd floor restrooms. Restrooms on 2M, the restrooms on the Student Union side of 3rd floor, 4th floor, and 5th floor remain open. The 5th floor study area remains closed for preparation of the Quiet Study Zone. Special Collections and Archives and all 5th floor offices remain open and accessible by south stairs or the operating elevator in the bank of 3 elevators. Construction on the Automated Retrieval Center between the library and the Student Union is moving forward. If you find the noise challenging, do not hesitate to ask for earplugs at the Circulation Desk. Thank you for your patience as the 21st Century Library project moves forward!